The Poet’s Haven was founded in 1997 as a place for artists across a wide and diverse spectrum to feel safe seeing their work published. We are open to submissions from both experienced, published creators and talents new to submitting work for publication. We offer no restrictions on length or style, and minimal restriction on content and genre. 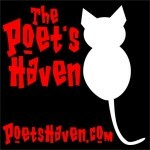 The Poet’s Haven publishes books, anthologies, podcasts, and online galleries. The press also organizes the quarterly Stardust Poetry open-mic series (held on the third Saturday of January, April, July, and October at Karma Cafe in Canton, Ohio) and the annual VENDING MACHINE: Poetry for Change event and anthology (held and released on the Saturday before Thanksgiving, also at Karma Cafe). For more information or to see the list of open submission calls, visit (www.PoetsHaven.com).